Her career has ranged from personal success as a recording artist, to touring with Merle Haggard, to prime song placements in TV and films. And, after 20 years in the business, she has established herself as one of the most beloved and respected writers and singers in American music. 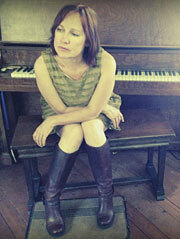 Please join us in welcoming Iris DeMent to the Clive Davis Theatre. The last of fourteen children, born in Arkansas and raised in Southern California, DeMent spent her childhood immersed in gospel and traditional country music. Now, The GRAMMY-nominated DeMent is ready to snap a 16-year break from original recordings with her new album, Sing The Delta. Hear Dement speak about the creation of her new album, as well as reflect on her impressive career. After the interview, moderated by Vice President of the GRAMMY Foundation and MusiCares Scott Goldman, Dement will take audience questions and perform a selection of songs.